Dear Brother, 1Cor 11:30 This is why MANY of you are weak and ill, and some have died… Please tell me this, how often, if ever, do you see this actually happening in the Church today? Also, all the happenings in the Acts of the Apostles, which are MANY, why do they NOT happen today? At no time was the Church ever under a covenant, or any agreement with God, we are under grace, and complete in Christ, All scripture is for us, but NOT about us. Please read Heb 8:8, Behold, the days come, saith the Lord, when I will make a new covenant with the house of ISRAEL and with the house of JUDAH;.. we are neither of the house of Israel or the house of JUDAH.. We are to rightly divide the word of truth.. God Bless.. Happens everyday world wide in the Holy Orthodox Church…the historical and authentic Church. Well said Pastor. Your mentioning that communion is done in community reveals just how much we need the corporate worship and sacraments. I appreciate you bringing this to the site for it is such a component of being part and partakers of the Body of Christ. Thank you Betty for your comment. You are right that Holy Communion is to be done on the Lord’s day and done every Sunday. This is not in the Bible and I would ask that family member where they get the authority to have Holy Communion every day. Many churches do it only once a month or quarterly (ever 4 months which is what we do). Great observation. You are so right. It is actually in the Bible. In the Catholic faith we celebrate the Eucharist on what is understood since the early church as the resurrection day, Sunday, the first day of the week or at sundown on Saturday as influenced by the prior Hebrew custom. One of the main places in scripture that this is mentioned is Acts 20:7, “The disciples came together on the first day of the week to break bread. At that time, Paul preached to them, and spoke till midnight, though he was planning to leave the next morning.” The first day of the week is considered Sunday as when Christ rose on the first day. It is also an apparent custom of the early Christians to take collections for those in need every first day of the week as instructed by St. Paul in 1 Corinthians 16 1,2 which further demonstrates that the early church met weekly. And we still follow these customs today. PTL! The idea of breaking bread (the Lords table) daily, comes from Acts 2:46, and the command of the Lord was to do this as often in remembrance of me. Many assemblies have different interpretation of how the breaking of bread may or should be held. But it matters more why we as Christians bread bread, rather than how often we do it. We must do it worthily (not being worthy to do it) there is a massive difference difference, between doing and being. I did not state every day but every Lord’s day or every Sunday, which is what her church calls Sunday . Does it say that Communion has to be every Sunday, Our church, United Methodist, doesn’t observe every Sunday, but the firstly Sunday of each month. Which is correct? Are there exact guidelines of which to follow? Sorry for my misunderstandings. There are no Scriptures that I could find that designate how often the Communion should be observed and so there are no exact guidelines to follow but surely doing it every Sunday may seen to make it more of a ritual than a somber experience. I believe your church does it well. Which is correct? The Bible is not clear on how often we should but it seems apparent by Paul saying that when we do observe the Lord’s Supper might indicate that it is not every Sunday (1 Cor 11). Thank you, I know several churches in the same denomination that observe at different times, but I agree that it could become ritualistic if done every Sunday. Amen Betty…Communion should never become routine or a ritual….well said and thank you so much for your keep insight into this very important subject. I attend a congregation that takes communion every week. I am no one’s judge and have no desire to begin an argument, only to explain why we do what we do. Acts 20:7 mentions the believers coming together on the first day of the week to “break bread”. Being aware that this could refer to a meal OR communion is what takes away my desire to judge anyone. There are contextual clues that make me think that the purpose of gathering was to share communion. I will tell you that it is at times a challenge to maintain the freshness of communion taking it each week, and there are weeks that I am not successful, but for the most part I am able to focus pretty well. 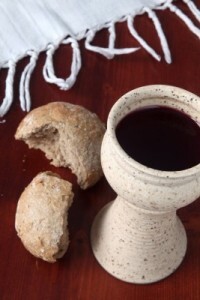 As has already been mentioned, the most important thing involved in communion is to recognize that it’s a celebration of the forgiveness given to us by Christ’s death and resurrection and from I Corinthians 11 a time to recognize that through that death and resurrection, we are made family to each other, children of God. All the glory goes to Him for that. Because the Lord said: Do this in remembrance of me, and “given for the remission of sins, and eternal life for those who partake of it, etc. and St. Paul said by doing this you proclaim the Lord’s death, communion can be done daily, not as a ritual, but out of our faith in the Lord’s words and his apostles. Thank you John but not everyone can take communion every day since most of us work (including me) and cannot go to their church to take it as some travel about 20 miles from our church to get here, so it can be done daily, but it does seem to be too much, doing it every day and it could lose its meaning and become a ritual. Do you have a facebook page? I would love to find more insist in the bible and I also write spiritual stories and could use some quick places of reference. I think it’s well established in Church history that Holy Communion was observed every week. It has only been since the Protestant reformation that some parts of Christianity ceased doing so. As I’m sure you know, Methodism grew out of Anglicanism, which has a very rich liturgical heritage that places Holy Communion as the focal point of worship. I suspect your traditional worship service does the same. You might check your Book of Worship. In my Free Wii Baptist Church we observe Holy Communion every 90 days. We are definitely part of the new covenant. Read romans 11:11-31. We as gentiles are a wild olive shoot grafted into the cultivated olive tree. We are Israel. Although you must remember that that the House of Israel has been lost among the nations for thousands of years. God gave them a certificate of devorce. The word Gentile means of the nations. Christ renewed the Covenant with his estranged bride (see Romans 7 and Deuteronomy 24) by his death and resurrection. I read the book COMMUNION by Joseph Prince and he stated in there .. One of the most important things is to be sure you view the bread as Jesus’ body and that by taking Communion you believe that HE died that we might be healed by the breaking of his body. That HIS death / stripes we ARE healed and that the juice/wine is representative (some believe it’s HIS actual blood) of the blood and forgiveness, salvation + .. He stated some people take communion 3 times a day at home. Not starting any argument…Just throwing it out there. Thank you Mrs. Dahl. I must tell you some things about Joseph Prince to warn you of this man’s teaching. He is strongly into the word faith teaching which means by faith one has the guarantee to be healthy and prosperous. This is clearly the vein that runs through many of his teachings. But if one does not know what to look for how will they notice it is there? Prince has changed the basic premise that the word faith teaching uses, instead of using faith, it is all “by grace,” so it has more of an appeal. Apart from the kudos, little is known about his theological training. Hagin’s teaching consists of many errors and heresies, and formed by his visions. But the main heresy taught is that Jesus did not pay for our sins on the cross but in hell, known as “Jesus Died Spiritually” teaching. It’s not difficult to know how much Prince believes of Hagin’s teachings (teachings); his background has certainly influenced his teaching on grace. In his sermon “Walking in the undeserved favor of God” (3/28/04), he said: “Now I’ve been in the Word of Faith circle and I find that Word of Faith preachers know about favor. Churches of faith know about favor. The thing that I wish many of them would say though would be this – to use that phase – undeserved favor. Favor is good and the teaching of favor has produced tremendous testimonies but I would rather the Word of Faith preachers like myself use undeserved favor because that’s the true definition of grace. Now I didn’t learn amazing grace from Word of Faith though I’m a Word of Faith preacher. I had to learn that truly struggling on my own.” (Source: Jonathan Koh Thoughts on New Creation Church-and grace, faith, health and wealth). These are his own words, admitting he is a word faith teacher. He then shares his theology with other Word Faith teachers like: Creflo Dollar, Kenneth Copeland, Benny Hinn, Joyce Meyer, Paula White, Fred Price and many others (in fact you can hear the echo of their teachers teachings in Princes). This becomes a grave concern as people are attracted to his inclusive message of grace. His only complaint of Word of Faith preachers like myself is that they qualify favor to “undeserved favor.” Word faith teachers do not teach healing and prosperity as favor but as something dependent on one exercising faith. Many that have lived in these teachings have been overwhelmed with guilt for not having the results promised. Where’s the grace? According to Prince if one fails, one struggles with a physical or emotional weakness or in their finances they are obviously not reigning, then they are not in God’s grace. We only have to go to the Bible to see this is incorrect. What of Paul spending much of his time in prison. Paul speaks of the sufferings for the gospel (2 Timothy 1:8-9). “To the present hour we both hunger and thirst, and we are poorly clothed, and beaten, and homeless. And we labor, working with our own hands; Being reviled, we bless; being persecuted, we endure” (1 Corinthians 4:11-12). I hope this warning helps you to see just who this man is. I agree with Jim Morno. Thanks for pointing out Acts 2:46 (breaking bread daily) God bless. That’s the best answer and scripture to point out concerning how often to take communion. Next post: What Do Christians Believe About Purgatory? What Does The Bible Teach?